Blondie and Brownie: Don't Be Tarty to the Party! If Valentine's and Presidents Day mean anything to me, it means winter's almost over and this is my last gorge-fest before stricter summer dieting! Oh, who am I kidding, Easter's in there and I love the Cadbury Creme Egg something awful. 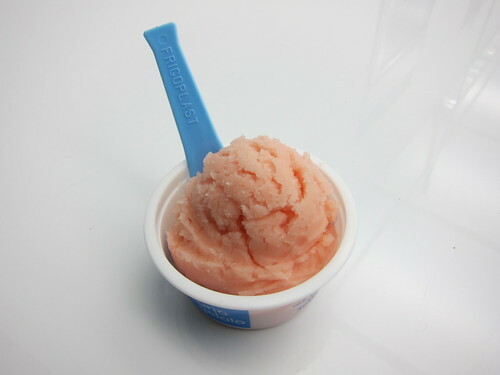 But it's still winter and I found another pick-me-up at il laboratorio del gelato of all places: their grapefruit campari sorbet. When Brownie and I found ourselves passing by the new store, which is open until 10pm or Midnight depending on the day, we knew we had to pop in to see the flavors. Still full from our dinner, I wanted something light that would remind me of sunshine and summer. Interested in yet another take on the grapefruit, I went with this sorbet. But the winning reason for this pick? Because the grapefruit pink color was so pretty. 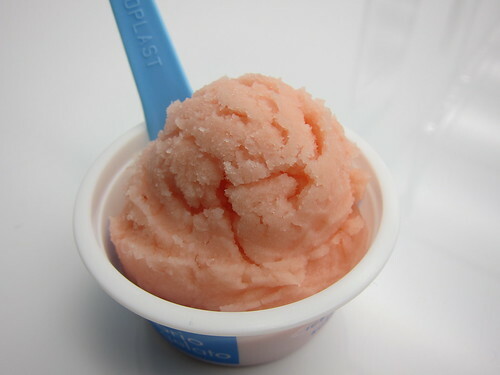 The sorbet relishes in the tartness of the grapefruit, and has subtler hints of the bitter and floral notes from the Campari. This is not a sugary sweet sorbet-both of us made the sour/tart face-and I loved this different take on dessert.